For the more independent traveller, these downloadable self-drive touring guide eBooks allow you to discover Scotland at your own pace. Plus, you have the added advantage of having a tour guide in your pocket. 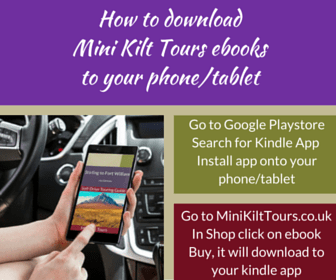 Each self-drive touring guide eBook is a day tour. YOU decide whether to stop at each place mentioned, and for how long. Every eBook gives directions to keep you on the right track but you also gain the added advantage of having places of interest pointed out and the story and history of each place. Some of these places you might not have found on your own. What are you waiting for – go explore!